Late last year, Urban Green Council launched Advancing Electrification, a roadmap for scaling heat pumps in NYC's large multifamily buildings. In Year 1 we’re developing priorities through stakeholder convenings and in-depth research; in Year 2, we will advance to implementation strategies, such as incentives and stakeholder education. 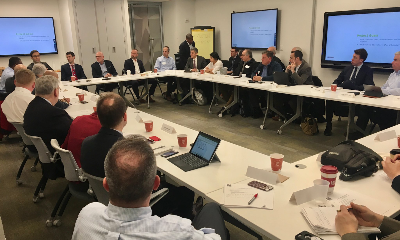 We were pleased to host our first major convening last week: the inaugural meeting of the 32-member Advancing Electrification Advisory Committee. With the Committee’s help, we’ll be taking a comprehensive look at the current capabilities of heat pumps and the challenges of installing them in large residential buildings. A critical component to NYC’s long-term emissions reductions, building electrification includes shifting heating and hot water systems to electrical technologies such as heat pumps. This transition is especially important in the multifamily sector, which accounts for more than 30 percent of the city’s carbon emissions from buildings. This groundbreaking work is funded by The Rosin Fund of the Scherman Foundation and the New York State Energy Research and Development Authority (NYSERDA). This event will highlight key findings from Urban Green’s upcoming report on ways to improve steam heating systems in New York's large buildings. Join us for our first member reception of the year! Catch up with colleagues in the green building community and hear what Urban Green has planned for 2019. 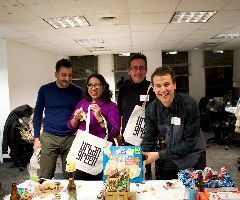 Last week, Urban Green and New York Passive House members tested out their building skills at our Gingerbread Passive House Competition! Teams competed to create the most sustainable gingerbread house using Passive House and LEED techniques. Congratulations to Team 5, who took the top prize with their incredible multifamily apartment complex, complete with insulation, solar panels and a rooftop garden! 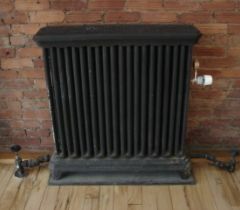 Did you know that over 80 percent of large residential buildings in NYC are heated by steam? Join us on February 12 as we discuss how fixing steam heating systems can save money, reduce carbon emissions and increase comfort. This event will highlight key findings from our upcoming report and tackle issues that affect NYC boiler engineers and contractors, consulants, policy makers and building owners. Join ASHRAE NY for their latest BMS Lecture Series event. Presentations will cover basic BMS design, BAS and security, spec writing and design pitfalls. Food and drinks provided.